All those after school triggers fueled by not enough coffee, churning out dinner, and managing your child's iPad time … It's all just about to do you in. And just when you think you’re about to get a big break? A chance to sit down for the first time today, peek at Facebook, sip your grapefruit La Croix — along comes your Mini Me asking for another show / another app / another YouTube video. And you’re starting to wonder, Is this what it’s always going to feel like? How do they have the energy? Not all moms are running this rat race. In fact, some of them are actually taking this digital age pretty slow, enjoying the ride. And I’m excited to let you in on exactly how to enjoy it, too, first-hand. That's what what we're going to dig into today. What the number one question moms of school age kids have about their child's online use is AND why this question isn't going anywhere anytime soon. The three pieces of truly BAD advice that are actually keeping you + your child from succeeding with online use balance. What the one thing is that all 3 pieces of bad advice have in COMMON — understanding this can change absolutely everything. Whose FAULT this all is and whose it definitely isn't — hint: it's not you! The 4 step system you can start using TODAY to fix this all right up — yes really, today. And 3 reasons why some kids take a 'lil longer to learn online balance — this is crazy-simple to fix, I promise. Today we’re going to be talking about too much screen time, a topic that comes up for even the smartest, savviest, and most well meaning of moms. Because even though you don’t have an interest in keeping your child offline, this topic still comes up for you because you’re wondering how much is too much screen time. 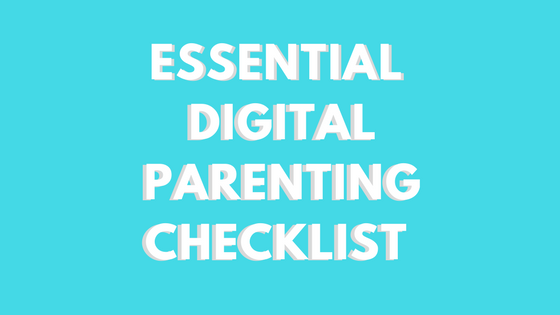 Before we get started, make sure to grab your new digital kid checklist. You’re going to want to have this on hand so that you don’t have to worry about taking notes or anything like that — it’s super detailed and helpful so click here to snag it right now. You’re worried about too many screens. 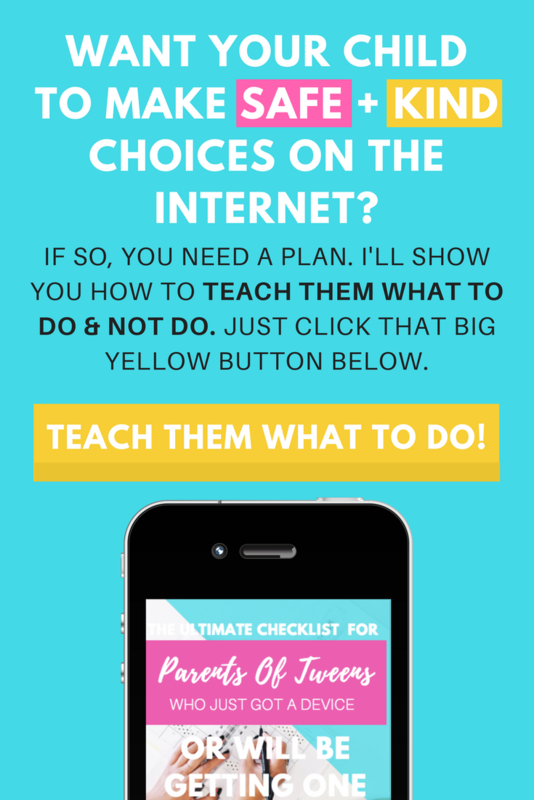 You don’t necessarily want to take the online world away from your child, that’s definitely not your goal! But because we are the first generation of parents of kids who are being raised with so much access to the online world without having been raised that way ourselves, we don’t actually know how much screen time is too much. We’re all trial and error-ing through this together and you just want to make sure that everything is going okay and that you're not giving your child too much access. The truth is that the sudden sinking-tummy feeling is super common. Like, so, so very common. It happens when your child has clicked into the next "suggested" YouTube video without asking or when "just 5 more minutes" of Minecraft has somehow turned into enough time for you to read through a whole drama-filled Facebook group thread about breastfeeding / time spent on homework / kids staying home alone / how bad Snapchat is / or whatever the latest drama is about. This happens one day. And the day after that. And maybe the one after that, too. "You’ve been on that for a million bajillion hours." And you have to admit that you sound an awful lot like YOUR mom did when you were little and she really needed you to know that your “Who’s the Boss?” marathon days were over. And the “Facts of Life” one, too. And while you were on the topic, no more Ms. Pac-Man until your homework is done, thank you very much! And, omg, you totally promised yourself that you would NOT nag like your mom did. You WANT your child to have access to the amazing things the Internet can offer her. And, truth be told, you believe that kids sometimes need a break to unwind. And so do moms. Are you doing this right or not?! First, I want to make sure that you know that you are not alone in this. Second, you should know that this struggle is so not your fault. And third, this is all super, super fixable. So start by taking a look at this checklist so that you have this information at your fingertips — or on your computer! I've been there, too, and I so have your back. I do have a system for teaching your child what she needs to know to have that healthy amount of time online. And I’m going to tell you exactly how it works today within this article. These three pieces of bad advice are what are really holding you back from making the progress that you want to. 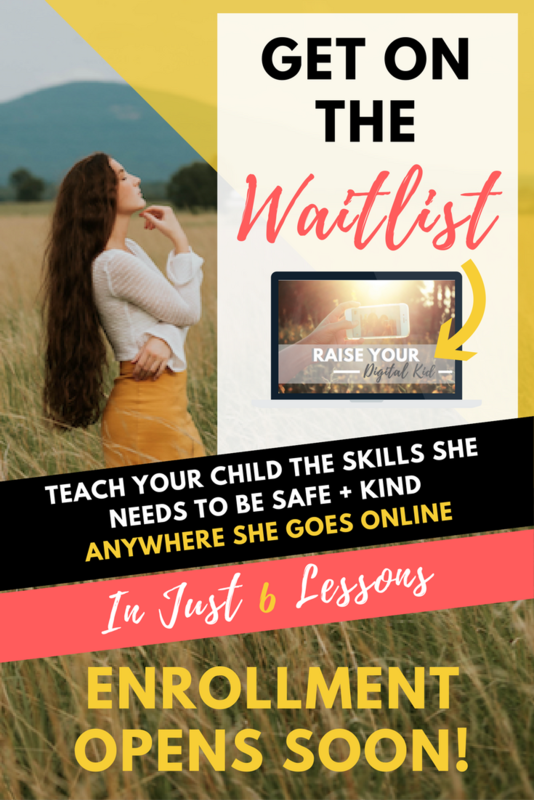 Which is really to just check this box already, to have this topic off of your to do list, AND to know that your child is doing what she needs to be doing so that she ends up having a healthy relationship with technology. And even though each of these pieces of bad advice are going to sound like they're separate or disconnected, they’re actually super closely related. And so right after I share what the three piece of bad advice are, I’m going to tell you how they’re so connected. That part is really important, so don't miss it. Bad Advice Warning: "Get that kid offline!" The first piece of bad advice usually These Little Waves moms don’t follow, but you've definitely heard it! It's that the best way to give your child a balanced childhood and a balanced, healthy relationship with technology is to keep her offline. There's even a well meaning, but highly misguided, “Wait Till Eighth Pledge” telling you that if you just keep your child offline, then she's going to be great. In fact, if you just sign the dang pledge, EVERYTHING'S going to be great. So that’s one piece of advice that’s actually really dangerous. Be sure to keep reading for a glimpse as to WHY advice like this not only doesn't work but actually does the opposite of what you want it to. For right now, what I want you to know is that even if intellectually or Mom-Philosophically you don't subscribe to the "Get offline!" 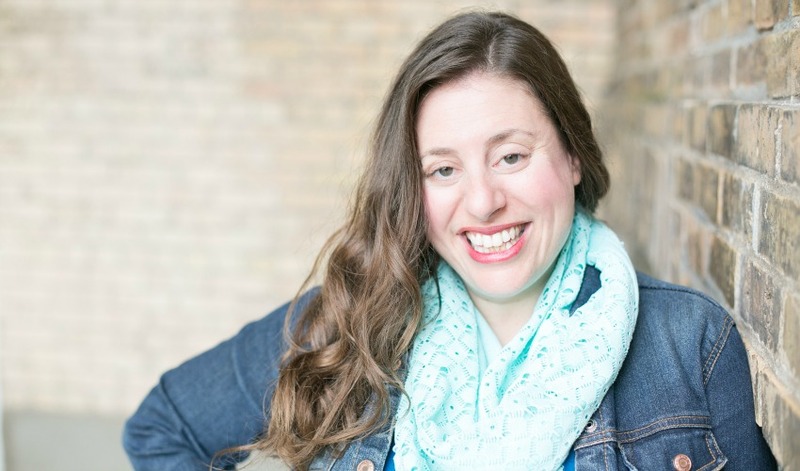 mantra, you’ve probably heard it enough times that it might be in the back of your mind and it might be holding you back from actually getting to a place where you feel GOOD about your child's online use. Bad Advice Warning: "There's an app for that!" The second piece of bad advice that might be holding you back is the advice that tells you to go ahead and digitize this parenting gig. How about all those monitoring apps out there that can just limit your child's screen time for you without you having to do a thing? There are SO MANY reasons why apps like these backfire as a long term solution. Too many to dig into today. So we'll lay them all out at another time, but let's take a look at a really common scenario in order to dig into just one big reason why monitoring apps aren't the MVPs for this long game. Let’s say that you've set your child's screen time limit for a half an hour per day. What happens when your child is using that time for homework, or for coding, for writing your grocery list, or for researching a play audition or a math concept, or maybe for reading a delicious new book on her library app? Then all of a sudden, the Internet turns off and you're being reeled right back into the discussion and the negotiation, messing with the settings, and frankly, just too in it. The truth is that these kinds of apps can't know what's exactly right for your family, your child, YOU on any given day. And — this is important: if the app is doing the balancing, your child definitely isn't. So that’s the second piece of bad advice that’s holding you back from feeling good about your child's screen time and that's making all of this much harder than it needs to be. Bad Advice Warning: "Blame it on the app!" The third piece of advice that's a 'lil too common for our own good is the advice that just says, you know what, if you just get your child off that one app, that one problematic app that’s leaching away all of her time, like watching YouTube videos or playing Minecraft, that everything will be just fine. There's a lot of faulty logic with this one. So much so that I wrote an entire blog post about it. You can read it right here. Snapchat, Instagram, Roblox — every app has the potential to be a "Bad App." This happens because the apps themselves change making it hard for you to keep up with rules when they're app-based. And because no one is born knowing the carryover, underlying skills they need to be safe and smart online — these have to be directly taught. When you're focusing on the apps, you're not focusing on the skills. Make this shift by NOT banning "Bad Apps" and instead TEACHING good skills. I explain all of this in detail here, so make sure that you read it! Now, did you catch it? It's SO important to clearly see this! That's why I gave you a clue up there about the common thread between all three of these pieces of bad advice. ... How to have the skill of balancing her own screen time or how to choose her own screen time activities wisely. And until she has those skills herself, it’s all on you. That’s why technology feels exhausting and hard and like it's conspiring against you to make parenting so much harder. I don't want this for you! So if the reason those other ways don’t work is because you’re not teaching your child what to do then, obviously, the exact opposite of that is to teach your child what to do. And there are really just four simple steps that you need to take to make this happen. The first step is to just meet your child right where she is — ask her what kinds of things she’s interested in doing. And I would encourage you to encourage her to pick at least three different things. Kids have so many interests and if you just nudge her beyond the first thing that she says that she wants to do, you might be surprised by what she's interested in doing. So let's say your child wants to play Minecraft, and she loves volleyball, and she's really curious about cooking. Those are three really different activities, but if you stop at the first answer and just hear that she wants to play Minecraft, you'll miss out on learning about those other interests. So encourage her to pick at least three interests, more is even better. Next, you’re going to integrate technology into the every day, which simply means that she needs to choose some online things to do and some offline things to do. The online stuff that she wants to do is just fine. She just can’t do it all day long. Third, you’re going to need to help her practice moving from online and offline activities, from the different kinds of activities that she's picked and that she has buy-in into as a direct result of being the one who picked them. Like anything else, you'll be helping your child weave a lot in the beginning and then you'll loosen up and be able to let go the more she can do it herself until suddenly, on a glorious feet up-La Croix filled day, this process — and skill — is all hers and it’s off of your plate. It's so much easier to let go in this way when you know you’ve taught your child what she needs to know. But, I do want to be fully transparent with you! Some kids will obviously take to all of this quicker than others. This is 100% normal! For the sake of no Fakebooking — FakeWriting? — I want to share my experience with this with you. When I was in the thick of writing my curriculum for teachers and my courses for parents in 2014, I would use my daughter Kayli as my practice-pancake. She’s my oldest and we started all of this when she was ten years old. So I really trialed and error-ed until I figured out what worked and what didn’t. And then, before I took what I had learned to presentations and schools, I tested everything I figured out with Kayli on Chloe, my middle child. So before I ever brought these practices to other peoples' families — where they consistently worked — I had two practice pancakes. Because even though everything I put together was based on what I knew from having an MA in Education and writing my thesis on Conversations That Teach, what I knew for sure is that you need to go through the ups and downs of this "stuff" yourself to truly see what works and what doesn't. At that time I would always use Brody, my youngest, as my example to explain that some children are going to be harder to take to this system than others. He really, really loves online games such as Minecraft way more than my girls ever did. Alongside of that, he has a bit of an addictive personality. When he was into Legos, he was way into Legos. When he got into his bike, he was way into his bike. And when he got into games, he was way into games. And then my third reason why it was a little bit harder to get him to take to this system was that he was really young. When I started all of this with him, he was only five years old. But when he was 8 years old we had a huge breakthrough with him and he started to monitor his own screen time as well. Now, this did not take me three years to put into place with him! He was just a little young to expect full independence. So we had the first three steps above in place for a long time and we stayed in that Gradual Release of Responsibility for a little bit longer than we did with my other two kids. That's a great place to be. 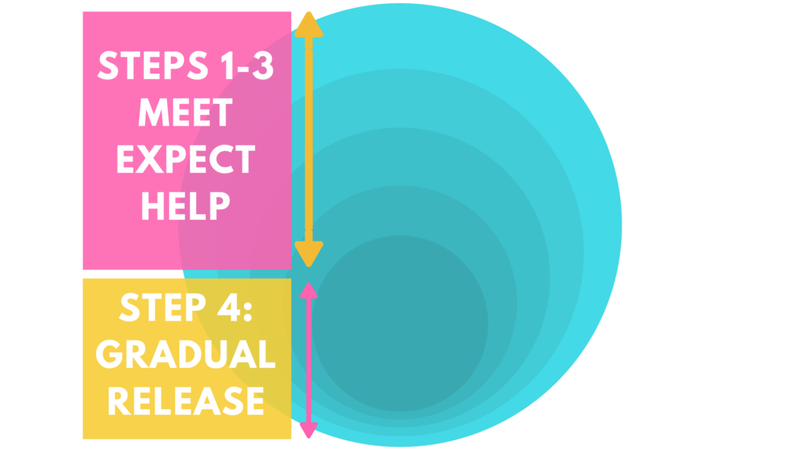 Pro tip: Once Steps 1-3 are done, Step 4 is easy-breazy. The reason that I’m telling you all this information about Kayli, Chloe, and Brody, is that I want you to see that truly any child can learn this and any parent can teach it. I know that it can feel overwhelming and exhausting. Every single time I talk to a new group of parents, more than half of them feel this way and ask about balance and about how much screen time is too much and it’s never that they want to keep their kids offline, they just want to be so sure that they’re doing it right; that they’re doing right by their own kids. And that can be emotionally taxing! And there is an end in sight. I’ve been here, too, and I'm going to help you every step of the way. In my next article, I’m going to reveal what worked for Brody, what was that turning point for us. What made it easier and better for him and what made it easier and better for me. Sign up right here to be sure to not miss this! I also want to remind you one more time to get that checklist. Because you're a Savvy Mom and after you drown your stressors in peanut m&ms, you get informed. 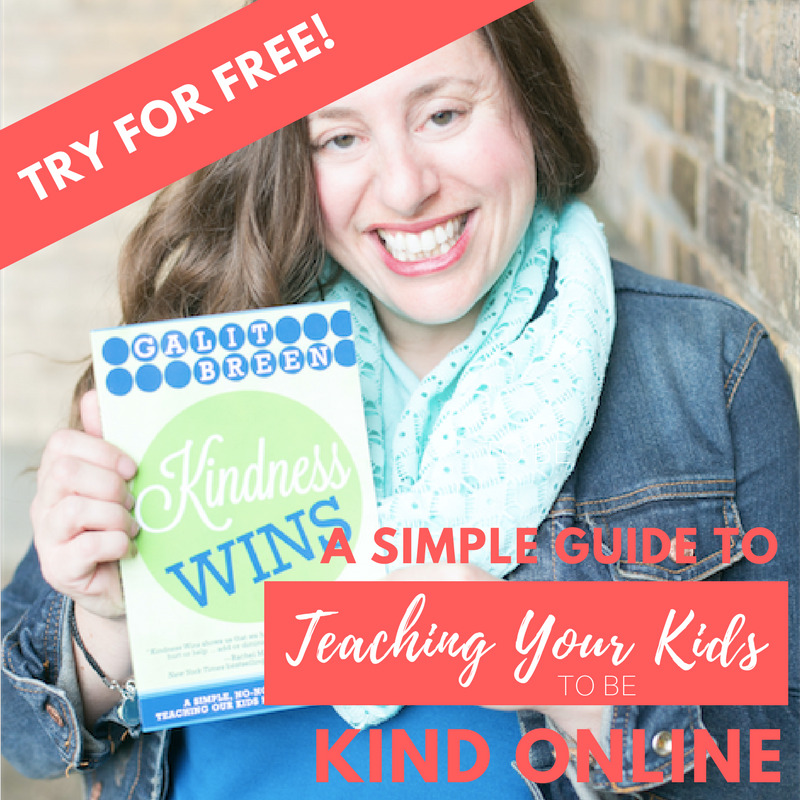 The concept of creating a healthy relationship with technology was born of my bestselling book Kindness Wins, a simple guide to teaching your child to be kind online. Because a world filled with tweens who use the Internet even just a 'lil more kindly? Is a better one, as far as I'm concerned. Read the first chapter of Kindness Wins for free by clicking right here or on the button below. Hi, I'm Galit. (*My name is pronounced guh-leet + means little waves, like in the ocean.) I give you the tools you need to let your kids benefit from the amazing things the online world has to offer them and create a popsicle dripping, chapter book reading (in one sitting! ), leaf crunching childhood that they deserve. Welcome, I'm so glad you're here. What can you expect from me? I spill it all right here.